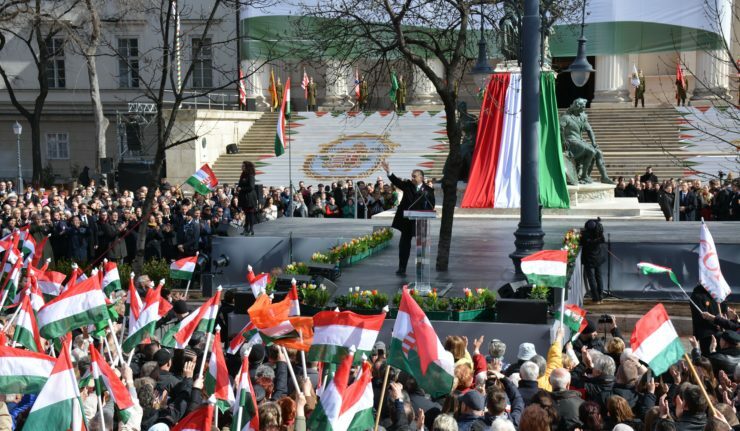 Hungary, Budapest – Each March 15, Hungary celebrates her struggle for freedom conducted in 1848-1849. A fight against the Habsbourg empire led among others by Hungarian republicans and which got support from Poland, notably the general Bem, the last standing general of the uprising. 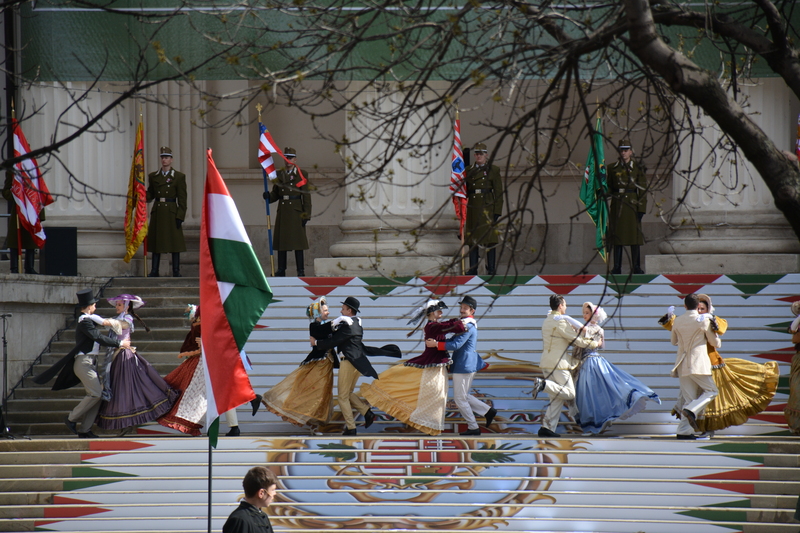 Historical reenactment during the ceremony for the uprising of 1848, on 2019 March 15, Budapest, on the front stairs of the National Museum. Photo: Visegrád Post. On this day, Hungarians wear a cockade with national colors and celebrate the unity of the Nation. Prime Minister Viktor Orbán invited on this occasion his Polish counterpart, Mateusz Morawiecki to Budapest, in order to celebrate together the help of Poles for this Hungarian struggle. 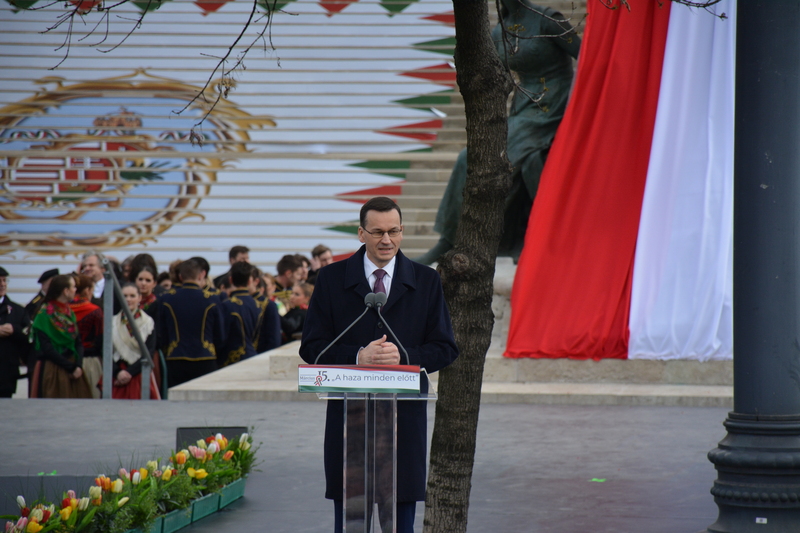 Polish Prime Minister Mateusz Morawiecki during his speech in Budapest, on 2019 March 15. Photo: Visegrád Post. Dear Hungarian friends, dear Polish friends who are here today, thank you for this invitation, and thank you for inviting me to this great celebration of freedom – our freedom and yours – and for solidarity. Hungarian and Polish friendship has lasted for more than a thousand years, since the time of the kings Saint Stephen and Boleslav I. This friendship continued during the reigns of Boleslav III and Coloman, a wise man who made his wealthiest lords pay two-thirds of their wealth to support the army, for a strong state. Together, our knights took part in many great, victorious battles – but also shared defeat. But they always fought shoulder to shoulder – 171 years ago during the fight for freedom, as 75 years ago in Warsaw, as 63 years ago in Budapest, and as at the time of Solidarność in Poland. We have been united in the past, we have fought for our freedom, and today, we want to fight for a better tomorrow. Today, we are the witnesses of a beautiful celebration. One can see the desire for freedom within each of us, and while coming to this celebration, I asked Viktor, “What is this plaque on the Museum’s wall?” I learned that this plaque memorializes Sándor Bauer. We have a similar hero, Ryszard Siwiec, and the Czechs have Jan Palach. These three men were united by the fact that they set themselves on fire to protest the crushing of freedom in Czechoslovakia. These three men bound us to each other: Sándor Bauer, Jan Palach, and Ryszard Siwiec. They are our heroes, who refused to accept dictatorship and foreign occupation. 171 years ago, when the Springtime of Peoples had not yet been victorious, the honvéd – the Hungarian soldiers – were asked to lay down their weapons and their flags. But they didn’t lay down their flags. They cut them up, distributed the pieces, and hid them in their houses and in their hearts. They hid their flags so that the winds of hope and justice could blow once again. And they did. 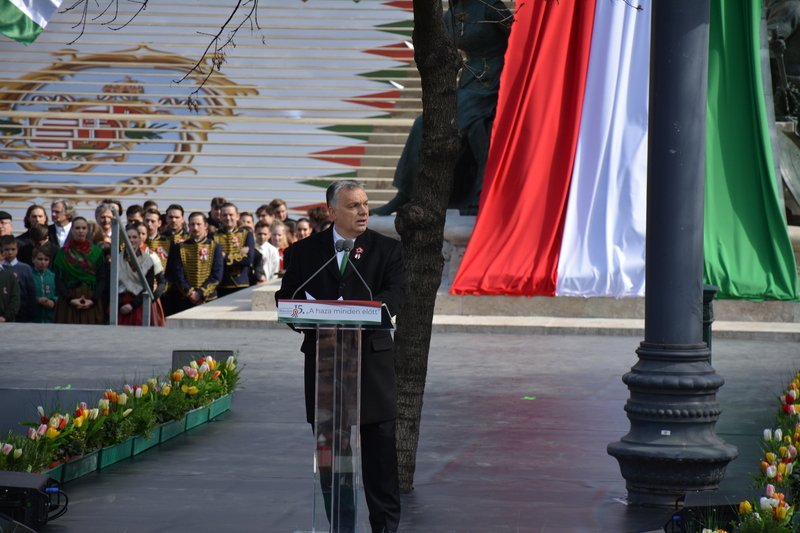 Our peoples, who are free today, are united around these pieces of flags – these pieces of our great history and of the friendship between Poland and Hungary. And in the same way that these flags are once again intact, our homelands are more than our individual destinies – these pieces of flags. Today, we fight for a better future. This better future depends on our will and our determination. Just as 171 years ago, we are once again on the side of truth, solidarity, ordinary people, and freedom. We are fighting today for truth and justice in the name of a better future for Hungary, for Poland, and for Europe. And we are more and more convinced that, just as they led us to victory in 1989, the Hungarian turul and the Polish white eagle will lead us to better days, for our children and grandchildren. Even if they spoke different languages, our two great authors, Sándor Petőfi and Zbigniew Herbert, were talking about the same thing: this great bond Herbert described, this unity, this Polish-Hungarian nation that Sándor Petőfi discussed. May this great bond unite and strengthen us, all of us: Hungarians, Poles, and Europeans. May it unite all of us who believe in the Europe of homelands, in a better world for ordinary people instead of the powerful ones of the Establishment. God bless Hungary, God bless Poland and Europe – may He give us a better future! Hungarian Prime Minister Viktor Orbán during his speech in Budapest, on 2019 March 15. Photo: Visegrád Post. The Poles are with us here today. They are with us here again, just as they were always with us: in 1848 and 1849, and then in the twentieth century. Prime Minister, please accept the Hungarian people’s warmest heartfelt wishes. Without Poles, Hungary would not be free today, and Europe could not have been reunified. The Polish people gave us Pope Saint John Paul II, and they also gave us the Solidarity movement. With this you changed the course of history, and we were able to regain our freedom and the independence of our nations. We Hungarians raise our hats in salute to the Polish people. Poland occupies a special place in the hearts of the Hungarians. Some say that such a close friendship between the two peoples is simply a romantic legend, which is incompatible with the unyielding laws of modern politics. But we Poles and Hungarians have felt this for a thousand years; and we believe that life itself is also a great romantic adventure – which is worth nothing without true friends. The story of our suffering in the twentieth century is a shared experience. We know what it means to be a friend in need. But now we are preparing for a future of another kind: we are preparing for a spectacular Central European ascent, and restoration of our former greatness. We are preparing for a Central European renaissance of overwhelming power, one that will sweep us to new heights. We are now able to be friends in a period of historic ascent, when we are finally able to live as we have always wanted to live. My friends, I visited Poland a few days ago. I saw that we need to redouble our efforts if we want to keep pace with the development produced by our Polish friends. Poland is the largest and leading country in Central Europe. When Poland is attacked from Brussels, the attack is against the whole of Central Europe – and against us Hungarians. To empire-builders who seek to cast their shadow over Central Europe, we have this to say: they will always need to reckon with the strong bonds between Poland and Hungary. The Fifteenth of March is the promise of national unity. “Let there be peace, liberty and concord”: this is the first line of “The 12 Points.” It reminds us that amid life’s hurly-burly and quarrels there should be a shared national goal that unites us. As varied as they are, with their myriad disparate desires, Hungarians are still united by the shared will that in Hungary a free nation should live in its own independent state. Since 1848, time has decided what is true and what is not true. Everything found to be worthless has passed through the sieve of time, and only truth has remained. The truth is that Hungarians have a right to their own homeland, and they have a right to their own Hungarian lives, as they see fit. Hard times may come – as they also did after 1848 – when the truth is pushed aside by the brute force of occupiers and unlucky alignments in the heavens. Hard times must also be endured. There were times when we could not live as we wanted to, but only as we were able to. But even in such times the truth is still the truth, because ideals always stand above everyday reality. Sometimes we have to live in the reality of compromise, but dream of Lajos Kossuth. And sometimes we have to live scattered across many territories, but dreaming of a shared homeland. There was never, is not, and never will be an empire – however strong and cunning – that could change this. We do not need words to know what another Hungarian dreams of. This is our true strength. That great son of Poland, Marshal Piłsudski, said: “To be defeated and not submit is victory”. This is not only true for Poles, but also for Hungarians. Our freedom fights have repeatedly ended in occupation, but we have never been truly defeated. Here – in the shadow of empires and at the crossroads of civilisations – in the end we won all our wars for the survival of the homeland and the nation, and for Christian culture. We were, we are, and we shall continue to be. The word “Hungarian” will once more be exalted, and worthy of its great fame of old. This is how it shall be, again and again, until the end of time. This is the greatest triumph that a European nation like ours can achieve over empires. Our forefathers taught that if you do not know what happened before you were born, you will forever remain a child. We are a full-grown nation, and we know what we must know. We know that instead of submitting to any empire, our ancestors in the first millennium chose a homeland in the freedom of the West. We know that, through their own free will, the chieftains chose the House of Árpád to rule over them. And we know that they freely chose to adopt Christianity. They fought tooth and nail for their right to freely choose – against the will of the Ottomans, the Habsburgs and the Soviets. We know that the lodestar of the history of the Hungarians is freedom, and the guiding thread is a succession of freedom fights. We also know that the notion of freedom is rooted in Christianity. In God’s eyes everyone is free and equal – whether rich or poor, and regardless of nation. Every nation is also equal, regardless of whether the fortunes of their history have been good or ill. This is why our Fundamental Law recognises the role of Christianity in preserving nationhood. Without Christian culture there is no Hungarian freedom – nor a free Hungary. This is true, regardless of one’s personal belief in God, or lack of belief. We want the scales to fall from the eyes of the peoples of Europe, and for them to realise and understand this: that without Christian culture there will be no free life in Europe; and that if we fail to defend our Christian culture we will lose Europe, and Europe will no longer belong to Europeans. We want the peoples of Europe to be cured of their partial blindness, and for them to realise that in a liberal European empire we will all lose our freedom. To be truly free one cannot be the subject of an empire: one must be the child of a free nation. A European can only be happy if they are allowed to freely decide their own fate and the fate of their nation. The day of the elections to the European Parliament is approaching. In another ten weeks it will be knocking on our door. We Hungarians must also clarify what is it that we want, and what is it that we can want. No one can want anything that departs from the essence of their history. In the Europe of 1848 the longest fight for freedom was fought by us Hungarians. In 1956 it was also we who turned to face the Soviet army: the largest in the world. And, at the southern borders of Hungary, it was also we who halted the migrant invasion launched against Europe. It is also we who want a strong Europe, strong nation states and strong leaders at the head of Europe – not bringing problems here, but taking help there, to where it is needed. We want a new beginning – in order to halt the decline of Europe and to end the fever dream of a United States of Europe, and to enable Europe to once again belong to Europeans. Hungary is a fantastic country, in a beautiful location, with a special culture and talented people. We are proud of it and we love our homeland. To love Hungary is to unify Hungarians again and again. And Hungarians can only be unified under the flag of freedom. In Hungary, if there is freedom there is everything: happy times of peace, security, many children, a flourishing country, a strong nation. For us freedom is not a goal, but the route to our goals. We Hungarians want simple things, just as in 1848: our own homeland, good neighbours, understanding partners, loving families, and work that has worth, meaning and results. Therefore for us freedom is not an abstract notion, but life itself: breath, lifeblood and a beating heart. Because we are free, life holds wonderful things for us Hungarians. The years ahead will prove that we Hungarians did not come into this world to suffer in life, but to give life meaning. Hungary before everything, and God above all!